Runtime library required for projects built with the GCC compiler by Innotek and Netlabs. 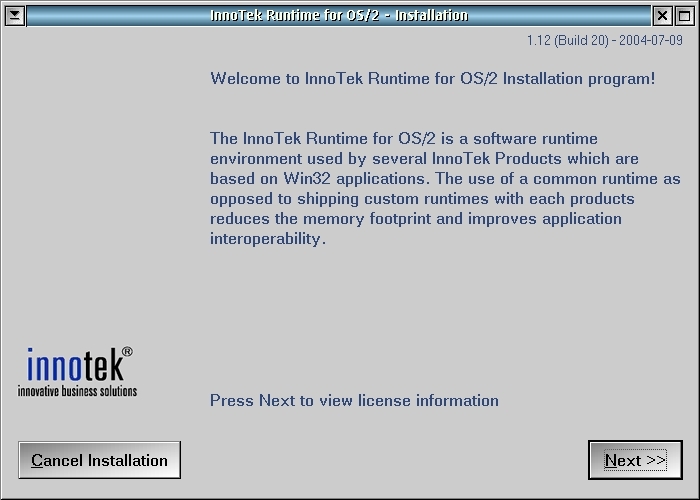 The InnoTek Runtime for OS/2 is a software runtime environment used by several InnoTek Products which are based on Win32 applications. The use of a common runtime as opposed to shipping custom runtimes with each products reduces the memory footprint and improves application interoperability. As most OS/2 customers today run more than one InnoTek application on their OS/2 system based on InnoTek's Win32 library, the common runtime will provide immediate benefits. Over time, all InnoTek applications will be migrated to the new common runtime. Through strict version and revision checking, applications will make sure that a compatible and certified revision of the InnoTek Runtime for OS/2 is present. Odin is the name of the project and software that allows users to run Win32 (Windows 95 and Windows NT) applications in OS/2 Warp operating system natively, almost as if they were intended to be OS/2 applications in the first place. It also makes porting from Win32 to OS/2 easier by providing a Win32 API implementation in OS/2: the Odin32 API. Innotek GCC compiler for OS/2). The runtimes for EMX 0.9d. Needed for many programs on Hobbes. Not required if you download the complete EMX development kit.